Psychmare before Christmas is the last of Interstellar Overdrive's regular excellent psyche-driven events that they put on around Manchester. Tonight's bill is packed with four bands, very different in their approach and outlook, but who keep in with the high quality of shows and line-ups these promoters always put on. 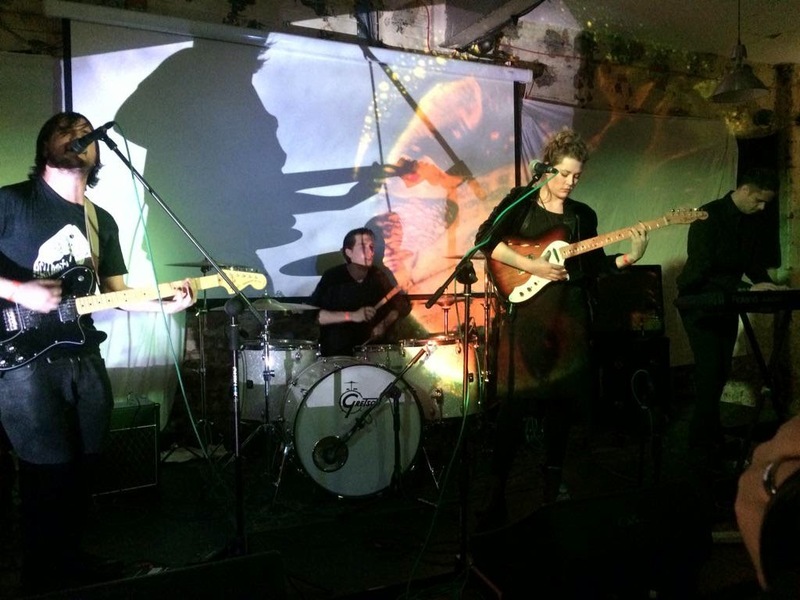 Opening up are Manchester's Brahma-Loka. They've been building up quite a following this year on the back of their debut tracks Key Of It All and Disciples as they prepare for the release of their debut EP early in 2015. This is our first time seeing them (as it is all bands on the bill) and it's easy to see why they've had such acclaim. They're a five-piece, their Facebook blurb calls them an "organic machine in motion, a five-membered chord, struck by the sole idea of one". We're not quite sure what the hell that means, but they're creating a sound that's loud and confident, brash and bold without forgetting to ensure there's a tune behind it all. Their stage presence is interesting, there's virtually no eye contact while they're playing, all lost in their own personal worlds from the hyperactive bassist, the guitarist to the left who has the riffs to back up his poses, the other guitarist who swaps between guitars and even brings maracas to the party at one point, the excellent drummer who is so key to bands of this genre and the frontman, slightly hunched, fighting his way through the wall of sound his mates are creating. They shrug off technical issues at the start of the set and thrill the expanding crowd. Next up are Enemies Eyes. This is apparently their first gig with a new line-up, expanding from a three piece to a four piece and newcomer Aisling sharing vocal duties with original member Matt. The dual vocalist approach works well, the contrast well-marked between Aisling's vocals which wrap themselves seductively and slightly menacingly a la Anna Calvi around the sounds her bandmates are channeling to Matt's more direct style ensuring a variety and depth to their set and that the audience's attention doesn't waiver. Their songs are probably the closest to what gets labelled as psyche today, carefully scuplted brooding guitar epiphanies with no shortage of underlying drama, poised at any moments to shed off the shackles and head for the skies. We couldn't have told that this was the first time they'd been on stage in this line-up and we'd definitely be excited to see them again as they develop that chemistry that comes with time. De facto headliners The KVB are up next. Unlike the other bands on the bill, they're more established, having three albums and a raft of EPs to their name already. They're a two piece with Kat Day on keyboards and Nicholas Wood on guitar and vocals and despite the potential restrictions that places on them they make a lot of noise. Dark, foreboding rumbles of electronica, short sharp blasts of guitar pummel the listener whilst Nicholas' vocals rumble just below the surface of the sonic waves. 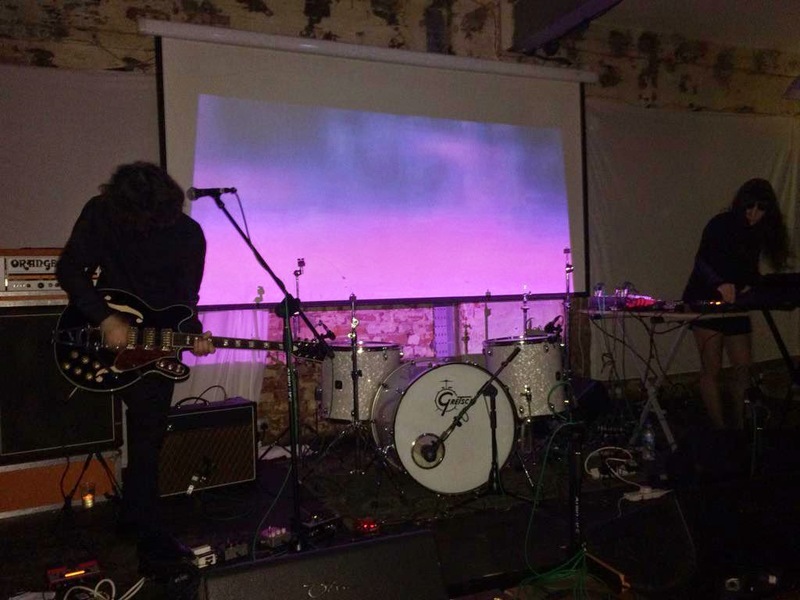 The other thing that The KVB manage masterfully is delivering a set that keeps the listener engaged; the sounds they create never feel repetitive or forced, it feels like we're being taken on a sonic and a visual trip through their creative minds accompanied by images projected on to the backdrop. They don't say much, they don't look at each other, but they don't need as they're as lost in the music as their audience. 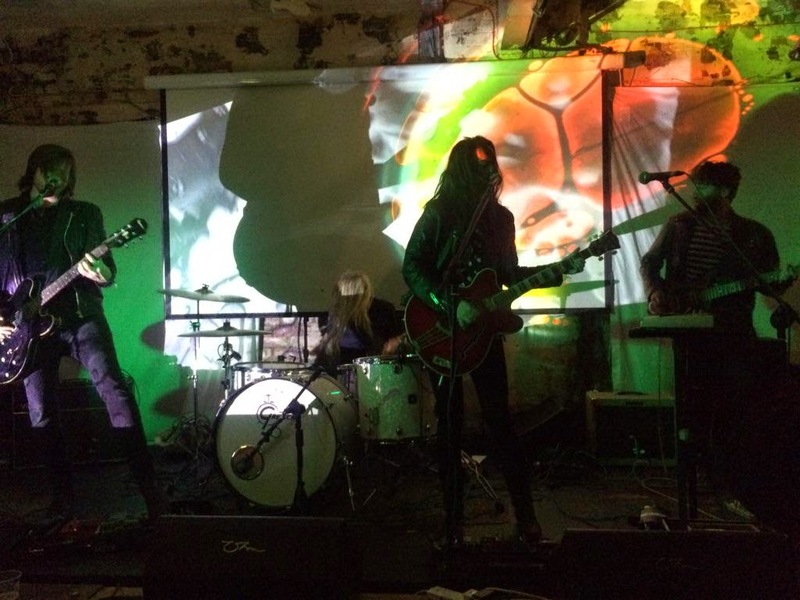 Last up are Saint Agnes and they are more than worth the wait and it's very apparent why they're being talked about as a band to watch for 2015. They have everything - big, brash, bold and dirty in your face songs that hint at so many things without sounding derivative, a boy/girl interaction at the head of the band that's intriguing and the ability to captivate an audience with their stage presence. They've also got a set of songs that over the three-quarters of an hour they play tonight demonstrate that they're ready to unleash an album on to us that wouldn't suffer from the peaks and troughs of quality that so many highly-tipped debuts do. They cut a supremely confident presence too, from the almost nonchalant mouth organ opening of first track Where The Lightning Strikes through to the way they shrug off the implosion of their keyboards for the six-minute closing dark blues stomp of this year's debut single Old Bone Rattle. 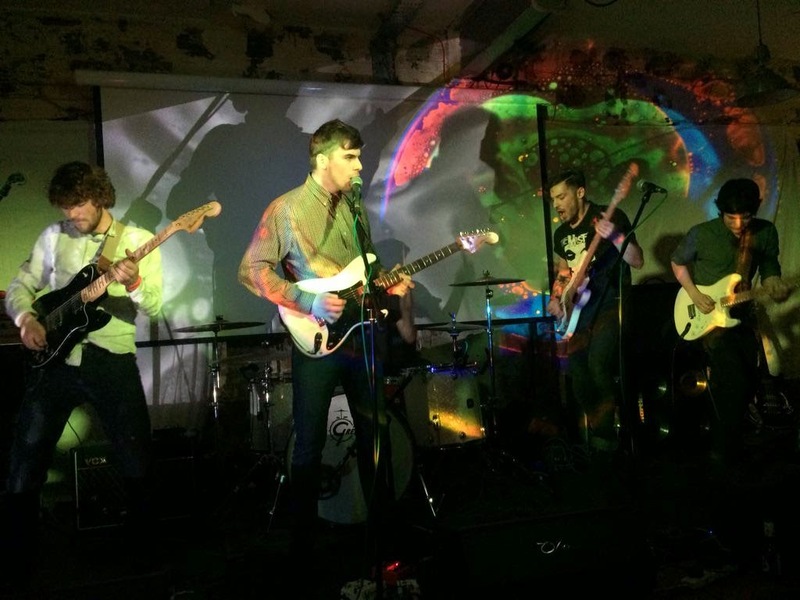 They trade in traditional rock, replete with guitar licks aplenty, with hints of punk and psychedelia, but the thrilling way in which they approach their live performances means it never at any point sounds cliched or repetitive. Their crowd love them, from the two guys stripped down to the waist attempting to crowdsurf to the cooler, more collected fringes of the room tapping their feet or shuffling along. Songs like Drowned In The River and Black Hearted and new single A Beautiful Day For Murder are songs with the capability of filling rooms much bigger than this and you wouldn't put your house against that happening in 2015. Brahma-Loka are on Facebook and Twitter. Enemies Eyes are on Facebook and Twitter. The KVB's website can be found here. They are also on Facebook and Twitter. Saint Agnes' website can be found here. They are also on Facebook and Twitter.